The Old Fire Station has a variety of offices, deskspaces and meeting/presentation/rehearsal rooms to hire by the hour, or let on long or short term. Please call Antoinette Spencer on 020 7607 9794 to discuss availablility and terms. A large, wheelchair accessible hall that adjoins a small kitchen with serving hatch. 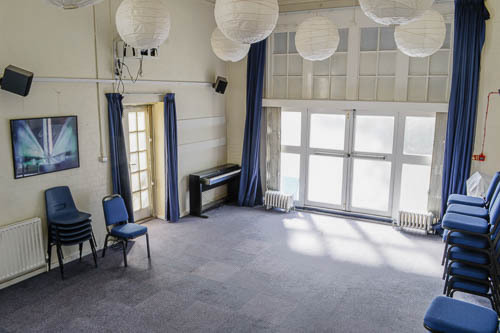 By far, our most popular room, it is ideal for exercise classes, as a rehearsal space, large meetings, children's parties, exhibitions and much much more. It can be subdivided if necessary and has very tall ceilings as this is where the fire engines stood! This room is a favourite within our building. It has a lot of natural light and opens onto a small garden. The room is supplied with up to date multimedia facilities, making it a great space for giving presentations, teaching classes or showing films. It is spacious and multi purpose and can be used in a variety of settings. The Room offers disabled access and WIFI access as well. The Stress Project is the Old Fire Station's sister community centre. It's just a few streets away from the Old Fire Station and is a counselling and complementary therapy centre situated in a renovated Victorian townhouse.